TEXAS HILL COUNTRY, August 3, 2015 – The 2015 Texas wine grape harvest is underway in the Texas Hill Country, with predictions of a banner year both here and in the Texas High Plains.Despite early season hail and a wet late spring in the Hill Country, Texas Fine Wine members predict promising crops at their Hill Country estate vineyards thanks to the recent heat and dry conditions that have promoted quality ripening. 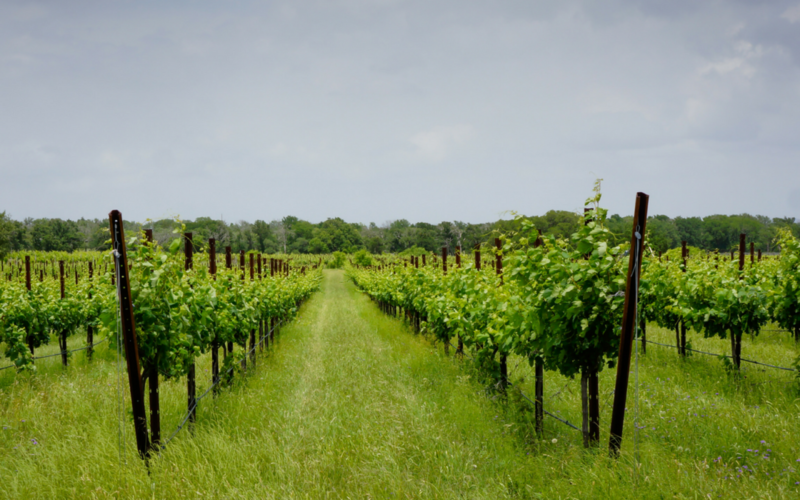 Record spring rainfall in both the Hill Country and Texas High Plains resulted in significant fungal disease pressure, but disciplined vineyard management practices have aided canopy development and kept the vineyards across the state healthy and productive. Quality harvests of Viognier, Nero d’Avola, and Sangiovese are making a comeback after the past two weather-havocked grape growing seasons damaged these varieties. The recent heat and dry conditions have actually been a welcome shift allowing for quality ripening in Pedernales Cellars estate vineyard. “With good vineyard management through the wet spring, our estate has managed to carry a promising crop to near harvest despite the very early season hail. To the west, our High Plains growing partners have had an excellent season thus far with substantial summer rains also giving way to a warmer late summer and dry conditions with continued cool to moderate evenings,” says David Kuhlken, Pedernales Cellars winemaker. “We expect the 2015 harvest to be one of the most balanced crops in several seasons,” Kuhlken predicts. Bending Branch Winery in Comfort expects to crush four times the amount of fruit this year compared to previous harvests and will be doing more bio/thermo cooler “flash” business this year with several more wineries, says winemaker John Rivenburgh. “We try to get the best fruit through our organic growing methods at the estate vineyards that contribute to our award-winning estate wines,” says Rivenburgh. “We also anticipate getting terrific fruit from our new vineyards in both the Hill Country and High Plains, and custom plantings of Tannat and Petite Sirah at Newsom Vineyards and Alicante Bouschet at Crimson Ridge in the High Plains,” says Rivenburgh. Thankfully, the Texas Hill Country and Texas High Plains were spared late spring freezes, despite several growers and wineries installing frost protection fans. “We installed two frost protection fans in our larger Newburg vineyard, which was devastated in 2014 by a late spring freeze, but thankfully did not have to use them this year,“ Brennan says. The Texas High Plains is not out of the woods yet, Reilly warns, with a protracted growing season for Montepulciano and Aglianico at Oswald Vineyards in Brownfield.